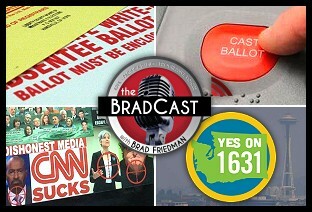 " Votes Flip to Cruz, TX Blames Voters; Still More Suppression in GA; Carbon Price on WA Ballot: 'BradCast' 10/26/2018	"
« PREVIOUS STORY "Voting System and Ballot Programming Fiascos Begin in GA, AR, IL: 'BradCast' 10/25/2018"
"Votes Flip to Cruz, TX Blames Voters; Still More Suppression in GA; Carbon Price on WA Ballot: 'BradCast' 10/26/2018"
Brad and Desi would need to have 10-hour shows for the next couple weeks to even begin to cover all the GOP voter-suppression efforts going on now. The GOP is lazy and cynical when working to, supposedly, serve the people (which it never does). But THIS is what the GOP finally gets serious about, and works their asses off for. This is what they LOVE ---- CHEATING. As a California resident yourself, Brad, you have heard the whining and complaining from drivers in this state about the sorry conditions of the road network and driving surfaces - UNTIL the gas tax (which pays for both) got raised. Now these numbskulls want to repeal the gas tax increase and pretend that all of these road construction and repair projects can continue. I've never been to Washington State, but somehow I believe that they have similar complaints about their taxes. I don't know how their state raises funds for their projects, but I feel secure in believing that the citizens of WA are complaining about the same things with the same motivations - and expecting something for nothing as too many do in the rest of the nation.